Sakai Guides and DocumentationSakai Complete User Guide AccessibilityWhat does it mean to make content accessible? Everybody experiences the world, including content they access on the internet, in their own way. How someone experiences content on the internet can be vastly different depending on the computer or device and size of the screen on which they view it, and how they interact with it. For example, while some people read text and interpret images they view, others use assistive technology to listen to content using a screen reader. Meanwhile, some people click on links using a mouse or similar device, while others navigate using a keyboard or by tapping on touch screens. Improving the accessibility of content is about reducing basic barriers to comprehension, such as providing alternative text for images, so that those who cannot see the images can grasp their meaning. Similarly, making captions or transcript text available for a video file can make it accessible to someone who cannot hear audio. For more technical information about making content accessible, see What are some guidelines for making content accessible? What does an example of inaccessible content look like? The next section on this page contains a photograph with no alternative text. It is an example of very inaccessible content. The reasons why it is inaccessible will become apparent by the number of questions we need to ask and answer in order to understand its content. What is depicted in the image below? The photograph above depicts a title page of a book, which was published in 1682. Unless you're curious about this image, which is irrelevant to the topic at hand, you might want to skip to the next question: Why is the content of the image above inaccessible? 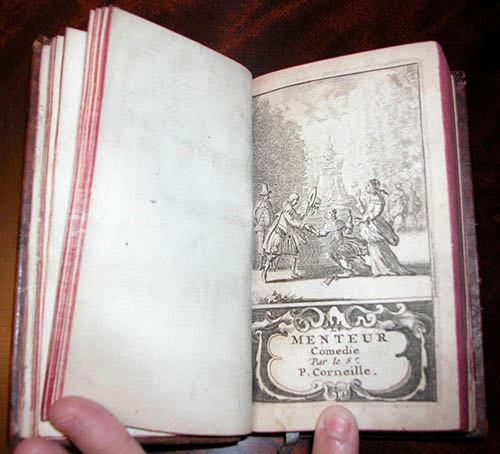 The book in the picture contains a play, titled Le Menteur, a French comedy written by Pierre Corneille. There are four young people, two women and two men, in a park. The two men are positioned to the right of a fountain (the reader's left), and the two women to the left (the reader's right). One woman has tripped and nearly fallen. The other woman stands behind her. The woman in back is holding up her right hand, but it's not clear what gesture she's making; maybe she's motioning to stop her friend from falling. The standing woman holds a pair of gloves near her waist in her left hand. One man has caught the falling woman by her right hand, and is helping her up. In his left hand, he has taken off his hat and is holding it up, as if to greet the women. He is dressed in nice clothing. The other man, who is more plainly dressed, stands demurely behind the man who is helping the woman to stand. Behind the people and fountain are some bystanders. You can't tell if the people in the background are watching what the other four are doing. Underneath the frontispiece is a decorative border that surrounds text. The text indicates the title of the play, that it is a comedy, and that it was written by Pierre Corneille: "Le Menteur / Comedie / Par le Sr. / P. Corneille." Why is the content of the image above inaccessible? Below are just some of the reasons why the image above might be inaccessible. All of the text included above regarding what the photograph contains is necessary for a screen reader user to get similar meaning out of it to what someone else might be able to interpret by looking at the image. There's no meaningful Alternative Text (Alt Text) on the image. A screen reader user might hear the image's file name, or nothing at all, where someone else might see an image. There's text on the page of the book, which must be typed out so a screen reader can present it to users. The image is small. It's in a format that doesn't allow you to zoom in on it to see it very well, so someone with vision impairment may have greater difficulty seeing or understanding it than someone else. The quality of the image is relatively poor. On a high-resolution screen, it may appear grainy or blurry. It doesn't have very good color contrast, and that may also make it harder for some users to see or read. What types of content are inaccessible? Certain types of content tend to be more inaccessible than others. Below is a list of the worst offenders that can cause barriers to comprehension, when they are not marked up for assistive technology to present them adequately or when they lack critical contextual information. Click on an item in the list for more information on how to make it more accessible. Next: What are some guidelines for making content accessible?